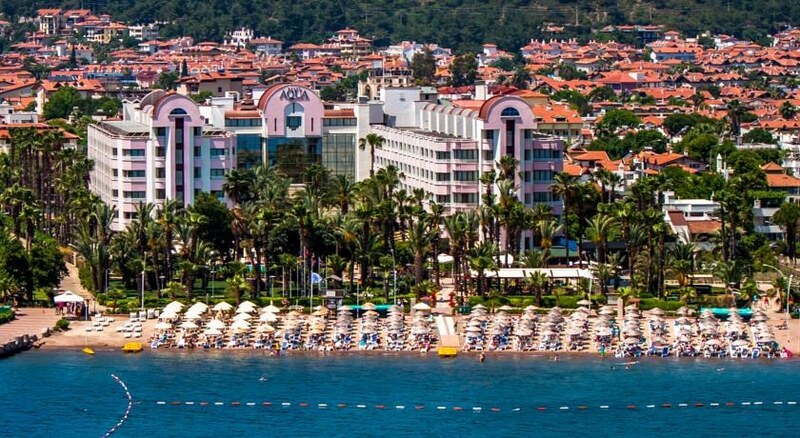 Hotel Aqua de Luxe offers you a true 5 star experience in the heart of the resort of Icmeler. Directly on the beachfront promenade, the hotel's grounds provide a relaxing and tranquil area for evening cocktails and dining, whilst during the day, soak up the sun on the hotel's sunbeds and umbrellas on its own 100m length of private beach section which edges the clear waters (awarded the Blue Flag). Watersports are in abundance in these calm waters, which shelve gently, suitable for the whole family. 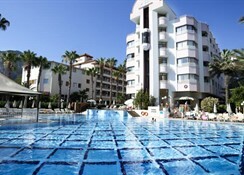 Aqua de Luxe Hotel is recently renovated, offering comfortable and modern rooms, a friendly atmosphere and all the facilities and great service you would expect from a 5 star resort. 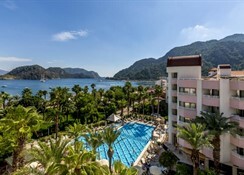 Centrally located for you to explore the rest of Icmeler with its many shops, bars and restaurants, as well as its own market on a Wednesday, or take a local minibus into the larger nearby resort of Marmaris. Food, drink and entertainment: Breakfast and dinner (buffet style) are served in The Aquarius Restaurant. With lunch being served at the Aqua Sun Restaurant. The hotel has 4 bars for alcoholic and soft drinks. Wine, beer and soft drinks are provided at the evening meal. All alcohol and soft drinks are produced locally. The beach bar and the A la Carte Restaurant are not included in the AI concept. 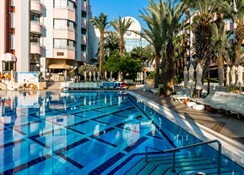 Sports, games and activities: Large outdoor pool, childrens pool, indoor pool, Fitness centre, sauna, Turkish bath and steam bath, massage (extra), table tennis and tennis facilities (extra), basketball, dart and volleyball facilities, water sports (on the beach, extra), aerobics, live music and full animation (every day and night). 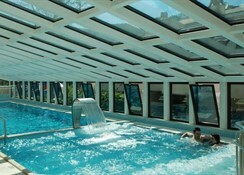 For the kids: Children's swimming pool, mini club, playground and children's buffet. Babysitting service is available on request. Additional: Hairdresser, photographer, jewellery shop, dry cleaning, laundry service, internet corner and library. Wireless internet is available throughout the hotel. Towel service for beach and pool is included. Guest relations service available. Please note some facilities and services will incur extra charges. All 240 rooms are equipped with air conditioning, mini bar, safety deposit box, tea making facilities, bathroom amenities, satellite TV, make-up mirrors, Pay TV (at a charge), step-out balconies, hairdryer, shaving mirror, slippers and wireless internet connection is available in all rooms plus lobby and garden areas. Standard rooms and suite rooms are available, with seaview rooms at a supplement.